Here's another flag for KLM featuring the modern logo on a white horizontal flag, as seen here. And here's the same scheme (new logo) but in inverted colors, that is logo in white, on a horizontal blue flag. These above mentioned flags are desktop flags (maybe souvenirs only). KLM was founded on October 7, 1919 being the oldest airline in continuous operation. Here's a picture taken on February 12, 2011 of Schipol Airport In this picture one can see the KLM flag on the far right, being the new logo in white on a blue background. 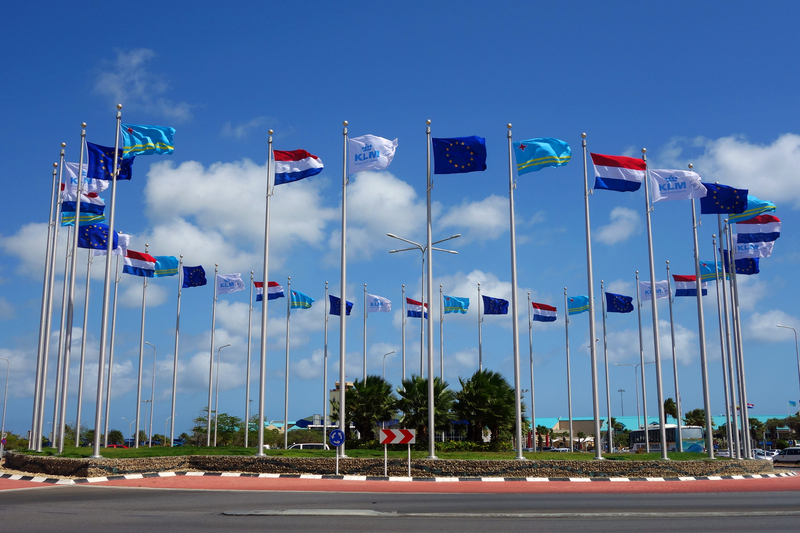 There's a variant for KLM flag, seen here in the following pictures: (third flag from left to right) and (flag on the left, next to the one of the European Union). It shows a white horizontal flag with the KLM logo plus the SkyTeam logo ), as seen here. Since KLM signed the MoU (Memorandum of Understanding) on September 13, 2004, then I guess this variant appeared afterwards. I wonder if you could help me with some research. 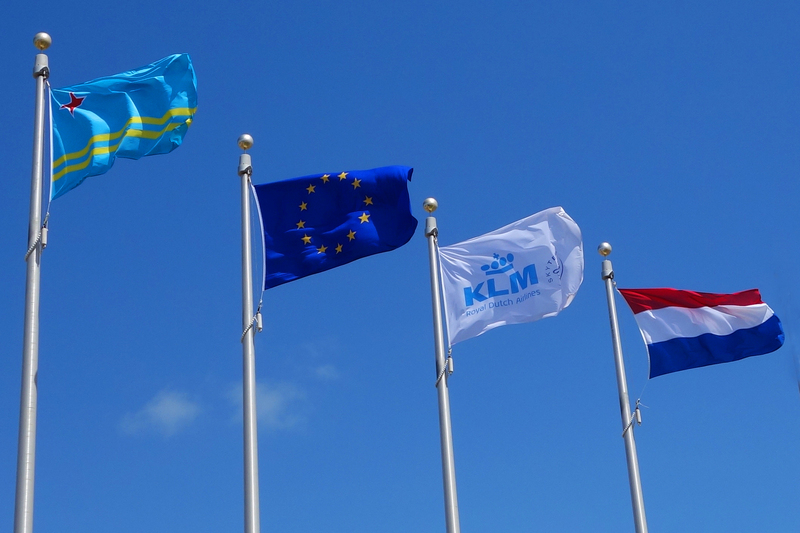 Do you know which flag was flown by KLM airlines (Holland) on their aircraft immediately prior to WW2? A photo of the aircraft can be found at this webpage. Not a good photo but I hope you can point me in the right direction. Looks like the normal Dutch flag but what is in the middle? The flag of KLM (Koninklijke Luchtvaart Maatschappij, Royal Dutch Airlines) was not red-white-blue, but orange-white-blue, with the logo in black in the center of the white stripe. This logo consisted of the letters KLM in a hexagon, two wings and a crown, and was designed by architect Dirk Roosenburg in 1919, the year the KLM was founded. I have seen this flag on photos from the 1930s and from the years just after WWII. In 1949/1950 a new logo was adopted (in which the old logo remains as a detail), which evolved with changes in 1959, 1962-'63 and 1971 to the one in use today. I have never seen flags with one of these logos. Source (logos, not the flag): Drs. G.I. Smit, R.C.J. Wunderink, Mr. I Hoogland, "KLM in beeld; 75 vormgeving en promotie", 1994.